Trans Iowa V8: What A Weekend! Okay, just a quick post today, because I am bushed. Trans Iowa V8 was a success, fun, a long slog, surprising, shocking, fun, a meeting of old friends, a making of new friends, weird, fun, bizarre, and did I mention it was fun? Eric Brunt wins, 19 finishers in all, mass quantities of folks passed through the checkpoints, and between the weather and the competitors, there were enough flip-flops to keep everyone on their toes. Oh yeah- "300 Miles of Gravel" was shown. It was, (if I may say so), awesome. You should see it. Okay- I'll start a full on race recap Tuesday. Stay tuned! Special Notice: To the regular readers of this blog: You will notice that for about the next week's worth of posts that the subject matter will be entirely about Trans Iowa. This event happens over the course of the weekend. You will notice several "Trans Iowa Radio" posts with an mp3-type audio track button which you can click on and listen in to reports filed live from the event. Then there will be a post race recapping of the event which typically takes five to seven posts for me to wade through. Okay folks, this is the day of the Pre-Race Meat-Up which happens starting at 4:00pm at the Grinnell Steakhouse in Grinnell, Iowa. I have everything packed up in my truck and should be rolling out this morning to do a last minute check of the route from the start to Checkpoint Alpha 52 miles away. I do not want any surprises in the first 10 miles like we had last year. Then it will be details like checking into my motel, setting up the Pre-Race, and getting going with the show. Of course, the big topic of discussion now is what exactly the weather will do. As of now, it seems that the rains will hold off till evening, then come off and on through until Saturday evening. Of course, the winds are scheduled to blow hard, and it will be cold. Some forecasts are calling for a high Saturday to only reach the mid-40's. Then it is supposed to clear off. Of course, it will be very cold for late April. Close to freezing. Sunday will seem bucolic and peaceful by comparison with scheduled sunny skies and cold, but warmer temps than Saturday. There will be "Trans Iowa Radio" posts, barring any technical difficulties, here on this blog starting this afternoon and running through until the close of the event on Sunday afternoon. Also, you can follow the event on Twitter by searching the hashtag #tiv8 . Okay, well that's it until I get a chance to post in the traditional manner here again late Sunday. Hope ya'all have a great weekend, and stay tuned for all the Trans Iowa V8 stuff you can handle coming here soon! I needed a break from the Trans Iowa madness yesterday, so I finally just set everything down, grabbed By-Tor The Titanium Mukluk, and headed out the door. It was spitting rain in the morning, and forecasts had predicted a thunderstorm in the morning, but it never materialized. It also got downright hot out. First time I have ridden in anything that resembled heat since leaving El Paso, Texas a month and a half ago. One thing about it was that it wasn't really humid either, which was odd, seeing as how the weatherman was talking rain. Well, the forecast was as wrong as it could be, and a glorious, sun speckled day broke out once I reached Camp Ingawanis and started riding. The trails were tacky. Perfect, really. Only one muddy spot, and it was tiny, was encountered on the entire ride. The wheels on the Mukluk continue to impress me. This is how 29"er wheels really should work. Going into corners with a solid, stiffer feel is really great. I can definitely feel the grip of the tires better without the vagueness of flex covering it up. Faster corners, faster technical riding. It makes me think that all 29"er wheels would really benefit from dishless wheel design. And the titanium Mukluk is just a really sweet ride. A fat bike that makes a totally great mountain bike. Sure- it has a long-ish wheel base, and the front is definitely harder to pop up, but I could see these as being great attributes for longer off road touring, explorations, and of course, slow speed stuff, which is what the Mukluk was designed for anyway. Eventually I had to go home, but it was a nice break from the recent business around here. I'm sure you readers would agree! This whole weather deal is really depressing me. I think I'll just have to shut down my hopes for a "decent" weather pattern to emerge for T.I.V8. That's right, it looks to be wet, cold, and windy right in time for the event. What is more, now they are saying Friday will bring a full day of precipitation which will no doubt make Saturday's experience on the road out of Grinnell very T.I.V6-like. 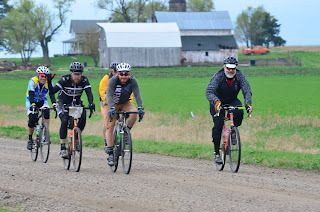 That was the first year we ran the event out of Grinnell and as the riders flew down the road, they were blinded by muck being thrown up by everyone's tires. Glasses were of no avail, and several riders reported being blinded off and on as they rode. A few even crashed because they could no longer see anything in the pack of riders. My only consolation is that thunderstorms are not forecast to be an issue, but then again, it is only Wednesday. They could be wrong about that! Then there is the cold. Yes- it will be in the 30's both Friday and Saturday nights, with a stiff northeastern wind forecast, and that along with wet folks will make for some big time misery. So it goes. Trans Iowa will bring the pain this year, lay it on thickly, and anyone that makes a slight error in judgement in clothing or nutritional choices will pay dearly. So with that in mind, I decided I would write you T.I.V8 riders a little "lament" that you can paste onto your race reports, if you want to. Don't say I ain't lookin' out fer ya'all! Once I was happy, full of hope. Thinking only the best thoughts for my future endeavors. Then Fear crept in and Darkness along behind. Meanwhile, clouds and wind gather on the horizon. Rolls of thunder come down the grassy hills. Suddenly my wheels come to a grinding halt. All visions of Happier Thoughts are covered in a clag of dark Iowa soil. Well, Sea Otter came and went over the last few days or so. It has become a defacto "Interbike" for the industry where new 2013 product raises its shiny new head and everyone gets their press release machines humming at their maximum potential. Companies are now flying media in for "World Debuts" at Sea Otter, or just before it. When was the last "World Debut" at Interbike for 29"ers? Well, there probably was at least one.....maybe. Actually by the time we got to Interbike 2011 it was all anti-climatic. Sea Otter and Eurobike had all the big news. Sea Otter this year really had the goods. Then you have the 650B/27.5"er thing, which I figured all along would show at Sea Otter, and I was right about that. Thing is, the industry is pushing news out about the wheel size that isn't really news. That's a whole 'nuther story though. No, what I found interesting was how several companies are latching on to the "27.5" moniker instead of "650B". I always thought sticking with the "650B" thing was goofy. 27.5 makes a lot more sense in marketing terms. Glad to see some companies getting away from the 650B moniker and its clumsy connotations when it comes to mountain biking. However that goes, now we'll see if this gets going.....finally. I thought the Norco and Intense offerings were pointing to where 27.5"ers will really catch ahold. Interestingly, one of the the Intense models was actually a slightly modified 26"er. I think that's rather telling. Back to Sea Otter- It was a great show for exciting new mountain bike stuff overall. Much more so than Interbike. I think the old, antiquated way Interbike is run might learn a thing or two from the mighty Otter. In fact, I think we could eliminate Inter and Outer Bike, (The consumer foil to Interbike), in one fell swoop by combining the best of Sea Otter, (it's dates, venue, racing, and riding ops), with Interbike's business focused intentions. Somehow a synergy of those two events into one would probably be a much more interesting thing for dealers, better for companies that are introducing product waaaay before late September/early October, and allow dealers to see the stuff far in advance so ordering and planning could be done well in advance. But that'll never happen now, will it? Well, the lead up to Trans Iowa is on in earnest now. I'm seeing a lot of familiar things during these final days. Riders posting about their jitters on their blogs, both Rookies and Veterans. Weather changes, course conditions in flux, and the same ol', same ol' routines that have become an April tradition for me over the past eight years now. Things like worrying about cue sheet accuracy, (it's looking really good), getting the cues sheets made, (they are done), and stuffing racer's bags, (also done already). Still, there are details to think about and to make sure that they are taken care of. My mind thinks of ten different ways to do things while I am doing another thing, and then I do it a different way altogether anyhow. Every year, while stuffing racer's bags, I always think about doing that for the first Trans Iowa with Jeff Kerkove. We were at the shop, and stuffing bags by walking around the break room table, assembly line style, until we were dizzy. Funny how some things seem so vivid after all these years. Well, as you can see here by the posts below this one, "Trans Iowa Radio" seems to be working. I "think" I've discovered why the few posts that didn't go up caused me to believe it wasn't going to work. My assumption based resolution for this is working. Okay- I'm going with that for now! Of course, the one and only detail I can not "sew up" is the weather. What will happen? Right now, it is an hourly changing thing, depending upon what you read. I do know that we're in an even numbered year, and it is true that every year T.I. has taken place in an even numbered year, the weather has played a major factor in how the event played out. T.I.V2- rained like crazy before and during the event, causing no one to even get to the halfway mark. T.I.V4, the wind and cold came for a visit. It was so cold it was snowing at the start, winds were like 40mph with higher gusts at times, and the roads, suffering from a very bad winter and recent rain deluge, caused the event to be truncated. T.I.V6 was a crazy, windy, thunderstorm infested run that ended in sideways rain at the approximate halfway marker in the event. The roads are good this year, so if weather kills us again, it'll have to be from some nutty, torrential T.I.V6 like event. Guess what? The forecast calls for "light rain" possibilities all weekend. But that can all change in a few days, and at that time we'll have a pretty good idea of what we'll be up against. 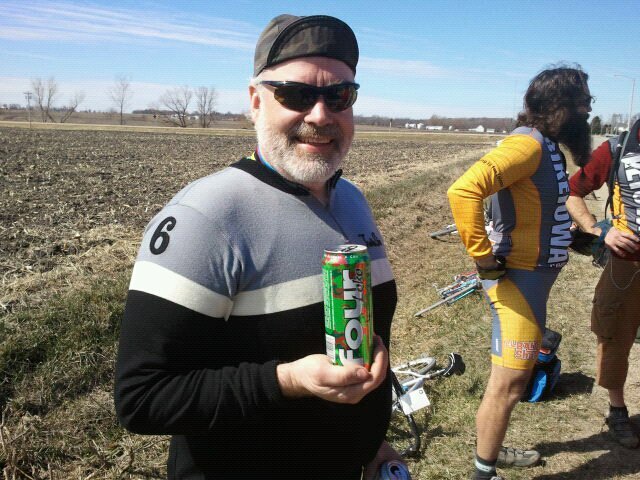 Whatever it may be, riders will be testing themselves against Trans Iowa V8 soon. Now where is that rain coat again? The Pre-Race Meat-Up is a must attend meeting. Some riders opted out of eating, but all riders must be checked in by me by 6:30pm Friday. Once we go into the main meeting room, it is too late for you to get signed on and receive the all important cue sheet to start. If you are eating, please arrive the closest to 4:00pm that you can and start grilling. We need to get the show, (literally!) started by 7:00pm at the latest. I want everyone to be getting into the meeting room starting at 6:30pm, and when everyone is in, we'll get started. Cue Sheet Details: There are 14 cue sheets total for the entire event. One for the first leg, Six for the second leg, and Seven for the last. They are not all the same size, due to how I had to cut them up to get the checkpoints at the ends of cards. There will be three cue cards larger than the rest, one smaller, the rest varying between. The largest ones are all the same size and barely fit into a Glad sandwich bag. The cues will all come inside a Glad sandwich bag when you get them at the Pre-Race and at checkpoints. NOTE: Mileage resets at each checkpoint. Riders will be getting number plates this year. I will be inspecting to see that you have one visible on your body or on the bike at the start line. This is being done to discourage any rogue riders, (I've had rumors of such a thing this year). No one without a number plate will be allowed to roll out with the T.I.V8 field! Anyone caught riding with unofficial rogue riders will be DQ'ed. Trans Iowa Radio: I finally got through the details to get this back on again. It will appear only here, not on the Trans Iowa site! (Sorry, you'll just have to accept the terms to listen, I'm sure the price is right). (<===HA!) I will also say that updates will happen when I can get around to it. They may not come through all that well. They may not post at all. I can not help that. I'll be out in the Styx and won't have the time to deal with technical difficulties. If it works- hey great! If not- oh well! Finally- I can not give details on every rider, nor will I. I can not give detailed updates as to where the leaders are at all times, nor will I. I do this for fun first, and if anyone gets anything out of it- well it is more than nothing. I am not Cycling Dirt, nor do I pretend to serve an audience in that way.Otherwise, sit back and enjoy what there is. See ya'all in less than a week! I recently "summer-ized' the Mukluk with some Handspun built 29"er wheels. They are made with fat bike specific hubs laced to 29"er hoops. This changes the bike, obviously, but I wanted to focus on how this bike, and the specific wheel set, changes wheels. Fat bike hub width used to be 135mm OLD front and rear, ala the popular Surly Pugsley. Makes a lot of sense when you think about it, since 135mm rear hubs are everywhere. Using a big, fat 3.8" fat bike tire required an offset to the frame to allow all the gearing combinations though. This forced the offset of the spokes to one side of the rim as well. Some felt a "stronger" wheel could be made for a fat bike with a symmetrical wheel build. This meant going to a wider, specific hub for a fat bike. The specific width was waffled on for a bit, but has settled on 170mm, at least for now. (Chain Reaction Cycles has introduced a 183mm wide hub recently) Another side benefit to this was being able to lace up a set of dishless 29"er hoops to the wider hubs for "summer time use". So you can get a fat bike and a mountain bike all in one. However; the effects of the wider hubs here are amazing when laced to 700c hoops. The wider base allows a better bracing angle and a dishless wheel build. Don't worry if none of that makes any sense. All you need to know is that these wheels are very stiff laterally. Much better than most 29"er wheels, unless they are carbon hooped. At any rate, you have to take the "not so good" with great here. The bottom bracket width hasn't been a deal breaker for me, so that seems okay. I do notice that my muscles get worked in a different way though with the wider bottom bracket. The suspension fork thing isn't all that big a deal, because I could swap out to typical componentry up front, but that defeats the advantage of front wheel stiffness here. I see this as an extension of what I was looking for when I bought the Mukluk frame. A bike that is very versatile with fat bike wheels. Now it becomes a bike, that with a wheel swap, can be an off road touring bike, a regular mountain bike, a single speed mountain bike, or even a gravel grinder. Although I am not going to start selling off my other bicycles, I could see how something like this could become a "one bike solution" for all season-all conditions" riding. So, here's a nice image from the T.I.V8 course..
Yeah, like I said a few days ago- You're going to hear a lot about Trans Iowa in the next days. It is only a hair over a week away now. I have been busy with the last bits of preparation in order to not have a last minute meltdown. Yesterday was all about getting the final form of the cue sheets printed. That happened, and it is the last big hurdle that I had to cross. Now everything else should pretty much fall into place. Now it is all about assembling the final cue sheets into sets, packing them into zip-loc baggies, and starting to put everything into the bags for the riders on Friday the 27th when they come to the Pre-Race Meat-Up at the Grinnell Steakhouse. I've got Clif Bar product already here, and Gu Energy product just shipped. I have boxes to pack for the Checkpoints and Finish line supplies, and tidbits to throw into another box for the Pre-Race meeting proper. I started putting together my re-route supplies to go into the truck as well. More details will get sorted on the weekend. As for other things of note- the film "300 Miles of Gravel" is finished and will be shown at the Pre-Race. If you live in the Milwaukee area, the project might be getting shown up there on Fox 6. I'll post up any details I get on that if it comes true. Hmm......am I forgetting anything? I have a guy driving the first leg of T.I.V8 by the cues, to triple check that sector. Then the day before T.I.V8, I am driving that sector again, plus I am checking on a B Road or two. No "Road Closed" surprises right outta the gate this year! For The Locals: Speaking of gravel road rides, I am going to instigate a bi-weekly, or weekly, (depending upon the interest), gravel road group ride. I'm calling it the "3GR". It's going to be geared at creating more of a community locally amongst those that ride and train on the country roads around here. I know plenty of riders go out, but everybody is pretty much doing their thing alone, which is cool, but this is a group ride option which really hasn't existed here since Jeff Kerkove left town. 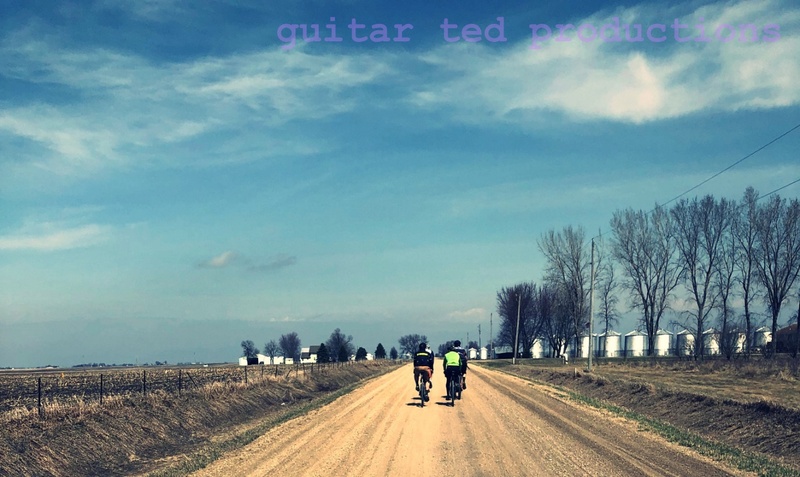 There will be bigger, more challenging opportunities as well, including my "Guitar Ted Death Ride Invitational" which happens just before RAGBRAI in July. There will also be a Salsa Cycles demo ride connected to this on June 29th. It'll be a "Fargo Adventure Ride", much like the ones that were held up in Minnesota, only shorter in distance. I'll probably call it something else too. Thinking "Fargonaut I" might be good. I've been riding the Fargo Gen II as my drop bar single track machine lately. I got it set up in late fall last year, and not much time transpired before I had found out I was going to ride in Triple D, and the fat bike took over. Well, now I am thinking on making a few minor tweaks. The saddle has already been adjusted a bit, and I may get a 10mm shorter stem, but I'm going to play with it as is a bit. Funny how small changes make big differences in feel. One bigger change I made was going from Specialized Ground Control tires to the Michelin Wild race'r. It has a really squarish profile, kind of like a Hutchinson Python, but not as sketchy. In fact, this Wild race'r seems to deal with the dry hard pack really well. The biggest thing I noticed is how smooth it feels. This is a nicely damped, supple casing. Okay, that's all the randomness for today. When I started off road biking on an actual off road bicycle, (as opposed to just riding any ol' bike in the woods), it was on a Mongoose Sycamore. It was an okay bike, but at the time, the shop where I had purchased it had a screaming pink frame with a custom build that would have fit me to a tee, but it was about $200.00 more than I wanted to spend. That bike was super sweet, and deeply discounted. I always kicked myself for not getting it, and "settling" for the Sycamore. Not that the Sycamore was "bad", it was just barely enough bike for what I was doing then. That pink number was a purpose built single track shredder. It would have been all that I needed. Well, the Sycamore was showing the kinks in its armor when I took it down to the local bike shop at the time, Advantage Cyclery in Cedar Falls. The owner took me aside and kindly explained how I needed the "right tool for the job" that I was doing. It all made sense. So, in late summer of 1991, I started looking for a new rig. I got stacks of catalogs, magazines, talked to lots of folks, and the owner of Advantage. Finally, in very early 1992, I decided on a Klein in Sunset Linear Fade. The Sunset Linear Fade was waaaay bright and had pink in it, like that bike I let get away. The cool thing about the paint job was that from a direct front view, it was yellow, from the side- orange, and from the back- pink. It was perfectly eye searing and I thought it was awesome. Yeah- I bought it for the paint job! Well- that and it had a press fit bottom bracket and a press fit, over sized bearing head set. Low maintenance and way ahead of its time. The problem was- for me- that the frame was ultra-stiff. Crazy stiff! So stiff that even small "G-outs" on our local trails would rebound the back end into the air. I crashed so many times due to this bike it wasn't funny. At least it wasn't to me. So one day at work a former shop race team bike came in. It was a Park Pre 925 in the neon yellow/blue colors. It was steel, my size, and rode about 10,000 times better than the Klein did. I picked it up and the Klein slowly started getting less and less rides. In a last ditch effort to make it work, I had a custom aluminum spacer machined so I could insert a Softride suspension stem into the steer tube. It helped, but I didn't like the weird monkey motion that it induced. So.....in 1996, I sold the bike. I knew it was still in town, and I am amazed to say that it pretty much, (with exception of the rear wheel and saddle), is exactly the way I had it in 1996. It came in for servicing the other day, and I got to clean it up one last time. Just like the old days. See ya down the trail, old friend! The LeJeune which I acquired last summer and started to work on in December has languished for a time. See, we really didn't have a winter, or much of one, so I just had to ride the fat bike when the snow flew and then it got busier at the shop right afterward when things warmed way up in February. My original plan was to tinker on this when things were in that "in between" phase in late February/early March, but that got waylaid and now it's nigh unto May and I haven't done a gol durned thing with this frame and fork. Well, the missed ride to work today due to a sideways blast of 41 degree cooled rain offered up the opportunity to load up this bike and get it back to The lab where I can start tinkering with it at odd hours. Now it resides in full bits and pieces glory between The Lab and the shop. I need to rebuild/re-grease the hubs and then the next order of business is to get the wheels built. That means jettisoning the ancient, soft, weak tubular rims in favor of a pair of Salsa Cycles Delgado rims I have hanging in the Lab. Spokes were cut by an old friend on a rad spoke cutting machine he owns. Perfect. This wheel build should go down without much issue. After that, the head set will be tackled, then the bottom bracket. Once everything is cleaned and prepped, I'll do a bit of tidying up with regard to the components and the main part of this re-build will be done. I do want to customize the free wheel though. I'll be wanting a lower gear on this rig, as the 53/42 crank won't give me any quarter. Then you get into the details. Look, this bike, although barely ridden as far as I can tell, isn't perfect. There are a few bubbles in the paint where corrosion is probably taking place. What to do? Re-paint? I'm not going to take this down that far. It's a bicycle. It's meant to be ridden, not to be a showpiece. So, I am cleaning it up, greasing it up where that needs to be done, putting on some good cables and housings, and riding it. I probably will give it a good waxing before all of that, just for good measure. And, as promised, it's going to do gravel duty. I am not totally averse to riding pavement, but I like gravel way better. I figure the Clement tires I got, the 28mm ones, will go on first, but at some point I am shoe horning in some 32mm tires and then leaving it. It'll be fun to see how the old school geometry handles the gravel, and maybe this will point me in a new direction for a custom gravel bike. 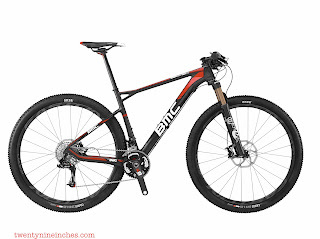 The BMC Orange Crush I posted about yesterday has some very tasty bits about it, but I want to see how this French version of road going might modify those thoughts, or not. Clean the bike you used at the Renegade Gentleman's Race. It needed it too. I had some gunk stuck on the drive train that required the use of "Euro Mechanic Techniques" to get off. The dusty gravel residue was easily got rid of, but with fenders and the various nooks and crannies that a bicycle has, well..... Let's just say it turned out to be a muti-houred task. I always say that if you really want to inspect your bicycle for an upcoming ride for potential issues, or to see what needs maintenance, a good, thorough, multi-hour cleaning session with your bicycle will show you anything that looks iffy. Your eyes will cover every square millimeter of the machine, and nothing will escape your watchful eye. At least, that's if you are not drinking beer while you are doing this! I've had this frame now for over a year and it is impressive. A nice riding, well behaved handling, good looking bike. Only one area has ever bothered me about this rig: The drop outs and their spacing. I wish that the "not-right" drop out spacing would have been spec'ed at 130mm. I ended up cold setting mine to "close" to 130mm because I hated fighting with the rear drop outs while taking a wheel out and replacing it. 130mm seems to me to be the logical spacing for a bicycle like this. Secondly, I wish it had short, track end style drops. Yes- with a derailleur hangar. The rearward facing drops would maybe make taking out a wheel less easy, but would definitely make riding the bike possible if you wango-tangoed your rear mech off in the mud, or just wanted an easy single speed option. I have been running this carbon fork long enough now to say that....."meh!" It doesn't really do all that much better than the steel one, as far as I can tell. So, I will be swapping out to the steel fork again, just to see if there is anything I might miss about that carbon one. Yes, the carbon fork is lighter, but that's all the difference I can find. I don't mind the weight of the steel fork as long as it does something better/different that I like over the carbon one. I have been running a weird drive train on this bike for some time now. It consists of an Ultegra crank set, compact 50T/34T rings, an Ultegra 9spd long cage rear derailleur, an STX top pull mountain bike derailleur, and a SRAM 9spd chain running a SRAM 11-34T cassette. Nothing to say here other than it works well and I want a smaller big ring! I left out the shifters since I've used two different set ups here. The STI Ultegra shifters are.....well reliable, and Shimano. The only issues here are expense to replace/maintain and the levers rattled against the shift paddles at times. Now I am running the Retroshift set up. Check out my take on the shifters here. Cowbell Handle Bar: Here's something I get hits on the site about consistently- The Salsa Cycles Cowbell handle bar is awesome. Probably the best gravel grinder bar for geared set ups out there. See my initial comparo with a Bell Lap bar here. Origin 8 Head Set: The head set is an "el-cheapo" Origin 8 unit, but it does have sealed bearings, a polished finish, and has been very reliable. The Velocity A-23 wheels have been thrashed all over the place. Rain, dust, streets, gravel, and dirt have not phased these things. I may have trued these once, but I am not sure. Either way, I am fully impressed with the way they have performed, and, rumor has it that new A-23's are tubeless ready. Nice. The bearings are as smooth as the day I got them, and the free hub body has never hiccuped once. The rims are 23mm wide and give the tires I use a decent base to work off of. They are available in a few different versions too. These wheels are currently shod with the Clement Pneumatics X'Plor MSO tires which I have reviewed here. Again, I have had really good experiences with these so far, and I will continue to experiment with them for the rest of the spring and into summer. Stay tuned for some updates on that in the future. The Ritchey post and stem, Bontrager saddle and grip tape, and other various bits and pieces are all functioning well. All around, I have to say that the entire package here is awesome for gravel road riding fun and racing. The Future: I originally wanted to do a custom gravel road frame, put all of my geared set up on it, and then transfer single speed duties back to this bike. I still intend to do just that, and I have further tweaks I would make to fine tune this bike to what I would desire. That said, if it never happens, the Black Mountain Cycles Monster Cross, (or "Orange Crush", as I like to call it), is a great enough rig that I could live with it happily for years. The handling is still great to my mind, and honestly, the tweaks I would make are more to satisfy my curiousity more than fixing any "defects" this BMC bike has. As I said, other than the drop out style and their spacing, there isn't much.....well- nothing really, that I can complain about here. So, it's ready for the upcoming gravel road rides, cleaned, no issues found, and all I have to do with it now is ride. Warning: You readers will be seeing a lot of Trans Iowa V8 stuff in the next two to three weeks. The event takes a lot of my mental capacities at this point, so......I write about it! Weather: So we're finally getting some very much needed rains at this point. It is forecast that possibilities of rain exist more than they don't for the coming two weeks, but again- Unless it rains to epic proportions I just don't see how the roads, (besides B Roads), will be very much affected by this. My feeling is that it has been so dry over the past 10 months that the water table is pretty dinged about right now. Scenery: Since Trans Iowa left the hills surrounding Decorah, Iowa after T.I.V4, we haven't had that super-awesome scenery on the ride. That will change this year. If you can manage to ride to the mid-parts of Trans Iowa V8, you will be in for a treat. The other thing about the ride that will be quite unusual is that most of the trees will be leafed out already. That isn't normally the case, but our early blast of heat in March sped the season up about a month. It has slowed down a bit with the colder temps in April, but look for the trees to be rustling in the wind this year. Apology: I have to apologize to some folks for hitting them with e-mails after they had already been contacted and said they were out. I missed justifying my computer roster with my hard copy roster and kinda messed up there. Sorry folks! Thanks to all who have replied to my e-mails concerning the Pre-Race Meat-Up. You folks are awesome. I only have not heard from two folks so far. Those two are Brian Hall and Jonathan Weissman. If you know these two, have them get ahold of me ASAP!! Otherwise the numbers for this year are down. Lots of injured folks out there this year. I hate to report that, but it seems to be the case. As of now, it looks as though we will see 76 total riders, which includes the three riders that don't count against the roster. As I said yesterday, there are always some no-shows and we've still got two weeks before T.I.V8. How many of you would like to bet that if rain is in the forecast the roster will shrink even more? My money is on shrinkage of epic proportions, but we'll see if rain is forecast. As of now? I bet we'll easily dip down into the 60's for riders and high 50's wouldn't at all be a surprise to me. It is T.I. after all. This ain't no hunnerd miler, ya know! Okay, it's another post of random weirdness. First off, we have fat bikes, rocks, and tricky maneuvers. That's right folks....fat bike trailsin! That's from my buddy John G up in the Twin Cities area. He's quite the trials rider, and he works at QBP, so this is a Surly sponsored gig of sorts. By the way, the rock pile he is working around in the short clip there is the one and the same that I went and checked out last Labor Day weekend with Ben Witt and Curtis the Wrench. I guess I'll have to keep my eyes peeled for the full version of this fat bike trials clip to come soon. Yep. That's the way it goes for me at this time of the year. I think about this maybe more than anything in the final days leading up to this event. So, here's how things are shaping up. The Pre-Race Meat-Up is almost all figured out. I have to forward the final numbers and menu selections in this weekend and that's that for the preliminary stuff on that end. I've got final cue sheets ready to go to print, but I'm holding off a bit to get a feel for where the roster numbers are going, so I don't print off too many useless sets. Speaking of that, the numbers are looking to go to a "more traditional level" than I had once thought. Last year there was a record number of starters at 76 riders. This year looked to be going great for numbers, as I had over 90 yet on the roster up until about a month ago. But since then, the attrition has set in, and now we're right at 77 overall, which will definitely sink lower. I always get a few no shows, last year I think it was five. So, you have to figure with a couple weeks to go and with the average number of no-shows thrown in, we'll be down around what we had start back in the T.I.V5 days. Probably in the 60-ish level, I would guess. I have been riding By-Tor The Titanium Mukluk some more with these Handspun fat bike hubbed, 29"er rimmed wheels. One thing about the wheels I didn't mention previously was how super-laterally stiff they feel. Those wider flanged, dishless wheels are a major difference in the way this bike rides compared to other 29"ers. Probably only my Enve carbon rimmed wheels can come close. 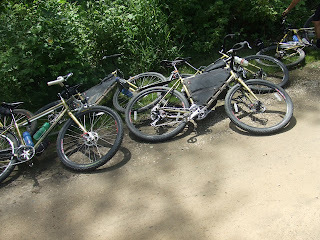 I had ridden Ben Witt's Potts 29"er with a fat front fork and a wheel made with a Paul WHub laced to a Crest rim, which I would not think would be a good match for a guy my size, but with the dishless front, the Crest was "okay". This Mukluk has a Stan's Flow on it, so it feels rock solid. Even the rear wheel is stable as all get-out. I know that back in the day, Charlie Cunningham and WTB were really pushing for dishless mtb wheels. Now I know why. I think it makes a ton of sense, and I am glad I have these wheels to thrash on for a while. If you have a fat bike, this is something that maybe you should look into. I was amazed at the difference compared to my other 29"ers. And there you have my Randomonium for Thursday. Have a good one folks! You know the saying- "Keep the rubber side down." Yeah, well, it could mean that you should stay in control and not crash and burn. Or.......it could mean that your rig shouldn't implode on you. Well......it didn't actually "implode', but I did have a bit of a touch and go situation there. See, I was at the Camp, and just was getting underway, heading up the service road to take the trails in the opposite direction than I normally do. I figured that it might be enlightening and definitely it would be different. Especially with the newer sections that have been added recently. So......I hear the sound that went something like, "brrrrripppGRACK,sssssnap!" , and I said, "What the....!!" I got off and surveyed the trail behind me but saw nothing out of the ordinary, so I took a look at the bike. Ahhh! There ya go. A bent derailleur hangar. Nice! Well, now I was off again! But wait! I hear a "creak, creak,creak", so I stop again to investigate it. Seems to be emanating from a suspension pivot. I check the bolts and everything is tight. Hmm.....I continue, but that creak is not fun to listen to. I get a ways into the trail system, ripping along happily, I might add, when my cell phone erupts into its ring tone, obliterating the zen flow I have obtained. Grrr.....! I stop and answer it. As I am talking with the rude interrupter, I notice a stream below me and an odd reflection in it. I take note. It is something being reflected in the stream and it is moving. The call ends and I stand transfixed on the odd reflection until I see that three deer are in the stream. What looks like a doe and its two nearly full grown fawns are down there. The two smaller deer appear to be a male and female, judging from their size, since one is obviously more muscular and larger than the other. The smaller deer are engaging in play. Stomping in the water, splashing each other, and frolicking like any two human kids might. It was pretty cool to catch site of that for about 10 minutes before they ambled off into the cover of the surrounding woodland. I was quite surprised that my Panasonic LX-3 was even capable of getting these shots at all, since I was a good 150-200 yards from my subjects. That was a pretty fun experience right there. I continued on with the counter-clockwise route. It was different, but better as far as flow went, I thought. I definitely thought it was easier this way. Especially in the newer sections. I carried way more speed than I recall ever doing before. The trails were really dry and hard packed as well, adding to the effect. The blue bells took a major hit with the hard freeze we had the night before. They were still pretty impressive, but I am sure they are done for. You could see plenty of evidence for that as I rode through there today. I decided to stop and get some last images from the massive display before they were gone. Who knows when that will ever happen again? Then I hit the end of the trail without any more drama and went on my merry way. It was certainly a lot warmer than when I had started. The early morning low was in the mid-20's, and when I had started riding, it had barely gotten to 40, but by the time I was done, it had reached up to the 50's. Regardless, I don't think my feet were ever really warm all day long. The following people need to respond to the e-mail sent out concerning the Pre-Race: Don Daly, Brian Hall, Brian Terhark, Nicholas Wethington, Dan Dougan, Steve Myers, Regie Romo, Ricky Markland, Phil Ellsworth, Mike Wallace, Jeffrey Losso, Jim Thompson, Brian Mann. This year is shaping up to be an awesome year for riding for a lot of folks, and we're only a little over a quarter of the way through 2012. Crazy. I've seen friends and acquaintances doing rides in all sorts of cool places, not just in North America, but all over the world already. If this keeps up, I'll be shamed to say I rode anything one tenth as awesome. But be that as it may, I am riding, and that's what matters most, no? I sure hope these images of far off places and super-tech terrain don't get you down, but that they inspire you. However; it sure is hard not to sit in front of the digital idiot box wondering what it must be like for these lucky souls and getting just a wee bit down about your "lack of epic-ness". Just remember, any ride can be an adventure- your adventure. You can own it, live it, and tell about it later. No matter what terrain it was done on. A ride on a bicycle is better than not riding and staring at a monitor. So, ride around the block. Ride to the store. Ride for an afternoon, morning, or under the moon. Cruise the earth's crust wherever you are. Whatever you do, just remember to cherish the time, stop and look around, and don't worry about anybody elses version of what constitutes a "big deal" of a bike ride. Have fun- go ride your bicycle. The Black Mountain Cycles rig: "Orange Crush"
Last Saturday's ride at the Renegade Gent's Race, (which I posted about yesterday), was a great ride for me. I had a lot of fun, and I rode pretty well for a big ol' guy like myself. One problem: Now I want to ride more gravel. Lots more. Addicted? Maybe. Definitely not satisfied. I do really like the feeling of being out in the countryside. It is a quiet, cleansing time. No other way to get that peaceful feeling and experience the big, wide world really does it like riding a bicycle out in the midst of the world. Maybe hikers feel the same way, I don't know. I'm not a hiker, but I suppose that may be a similar way to get the same high. One thing I do know, I like the longer rides, and I need to get more of those in. I couldn't help but think about the longer rides I was doing about five years ago. 80 milers, an occasional hundy. I could take more pictures of barns, see more unusual things, and find out what's over the next hill. But that needs to be worked up to. You just don't throw down a hundy after doing nothing for months in the miles department. Fortunately for me, the miles have been there to some degree. Not what it should be, mind you, but I have been out there riding. But the thing is, Trans Iowa is coming up. That means that I have some days that maybe I could be gravel grinding that I won't be. It's cool though, because I honestly am stoked about the possibilities for awesome experiences folks might have out there. I know some folks think of me in less than favorable terms when it comes to my courses, but I really do want folks to see the whole deal. This year especially, since I designed the entire thing. I think every mile offers something pretty engaging, and I even wish all of it could be seen by daylight, because a lot of it won't be. It's kind of ironic that I don't ride a lot of my courses, because I really would like to do just that. Maybe I'll take some time to string some parts of T.I. courses together and do that in the future. Well.......in fact, I have done that. Some of the GTDRI courses are either predecessors to T.I. bits or recaps of T.I.bits after the fact. The 2012 version of the Renegade Gents Race is in the books and this time the event was memorable for weather and road conditions. It was a long, fun Saturday for sure. I had done a fair amount of laying out my kit on Friday evening so that when I awoke at 4:30am on Saturday morning I wouldn't have to scramble around making noises while the rest of my family was asleep. The alarm went off, I made some oatmeal and had a couple slices of toast, loaded up the "Truck With No Name" and hit the road about 5:45am. The full moon was setting into a bank of clouds while the sun was announcing its arrival with a glow in the east. The forecast called for occasional thunderstorms and a high of 60 degrees for the Des Moines area. As the sun arose in a spectacular display of crimson and orange I was reminded of that old saw, "Red skies in the morning, Sailors take warning!" I began to see wet sections of pavement on my trek down I-35, and I was hopeful that the worst had already passed by. I arrived at Kyle's Bikes in Ankeny and began to see several dozens of cyclists kitting up, waving to me with friendly faces, and looking furtively towards the west. The sky was getting that "angry look" that says rain is a sure thing. We even saw a bit of lightning at one point. My team mates all were there and we had signed in. Cue sheets were actually spoke cards like last year that we center punched in the corners and zip tied to our handle bars. Our start time was at 9:08am, so we set off to the start area, about a mile away, at 8:50am. This was exactly when it began to rain. Of course! We arrived at the start area where there was a little park and a gazebo in the center provided us with a bit of shelter until it was our turn to set out. The rain had tapered off somewhat, but it was still coming down pretty good at this point. Getting out of town required riding a few miles of busy city streets until we hit the first gravel. By the time we got going on the unpaved roads, the rain had tapered off to mere sprinkles. I heard a hissing sound and became a bit alarmed. I called out that I had a flat tire. I thought it was my front, but it was still up. Checked the rear. Good. Hmm...well, let's go! As we took off again, I heard the same sound. Turns out it was our tires on wet gravel. I had never ridden on wet gravel when it wasn't lightning, storming, and windy, so I guess that sound of wet tires on wet gravel had never reached my ears unsullied before. False alarm diagnosed, we took off with a constant chatter amongst team mates. The Renegade Gents Race is a team event. Riders on teams of five must start together, check in at a midway checkpoint all together, and finish all together at the end to get an overall time which is then compared to the times of other teams. The team with the least amount of time to cover the 66.5 mile course wins. My team consisted of the same people as last year: Steve Fuller was our "Captain", and David Corneilson, Sam Auen, and Bob Moural were the others on my team with me again. We all seemed to be pretty well matched for pace and we all seemed to be able to get along pretty well. None of us were/are averse to stopping now and again, we don't mind having a beer once in awhile on the ride, and we don't take ourselves too seriously. Of course, this doesn't mean we weren't pushing ourselves pretty hard, and that we didn't expect a lot out of ourselves, because we did and we do. The roads were okay to start out with. 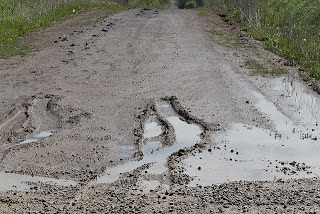 Of course, they were wet, and another thing about these roads that struck us was that they had a high sand content. This made the surface a bit mushy here and there, with our tires digging and cutting in sometimes. There were even a few hills out this way, but nothing terrible. I found myself hanging in with the group pretty well, which I was happy about. The beginning of the event started out just like last year's course, but we then ended up going west a fair bit, then north a long ways. The event organizers had obviously done a fair amount of recon to pack in more actual gravel miles over last year's course, which was predominantly pavement at the end of the event. Good job guys! The team that was to start ahead of us was penalized for not having five team members, so they started behind us, and we hadn't been passed yet by 20 miles into the event. Then Sam saw "Unicorn Ave" and he wanted a picture by the sign. As we waited for Sam and David to get the shot set up, we could see two teams coming up the road. One was the blazing fast team of event organizer Rob Versteegh. They went flying by, and as we got back on the course, the next team coming up the road were the guys and gals that had started 10 minutes behind us. We fell in line with them and ended up passing back ahead of them, (temporarily), until we got to the mid-way checkpoint where we were to check in with the volunteers. The checkpoint was in Slater, Iowa at mile 33.2. Coming into town from the north there was a mile and a half of fresh, deep gravel spread across the road way that made riding very difficult and riders were scrambling to find a line. Little did we realize that this would be a portent of things to come later. At the checkpoint we decided to rip into Bob's 12 pack of Budweiser while Sam busted out a can of 4 Loko and we munched on whatever food stuffs we could find in our drop bags. I managed to get a half a banana, a gel packet, and the rest was drink. We weren't there all that long and we decided to bug out. So far we were all doing okay, we had ridden through several rain showers, and the roads had been pretty good so far, with the exception of the ones coming into the checkpoint. As we were leaving the checkpoint- northward and westward-we realized that at some point we were going to have a long slog southward. After a bit of a nice eastward run, where we were all riding together and having a lot of fun doing so, we made that fateful turn for 14 miles of straight into a south headwind fun. That's when it all went to heck. The roads were freshly graded and overlaid with deep, chunky, loose gravel. There had been no, or very few cars or trucks on this, so it was pretty unconsolidated, shifty rock. We figured out pretty quickly that getting to the extreme right or left was where the best lines were and where the deep rock hadn't been spread to. This wasn't fool proof though, as graded berms, loose, sandy soil, and skinny lines at times made it just as difficult as running out the loose gravel. Adding to the road difficulties was a Southerly wind that was making forward progress difficult. This was often accompanied by a mist which would threaten to become full on rain at times. So, wet, windy, and washed out riding was making for slow going. All of this was a bit much for my team mate Sam on this day. His progress wasn't what he wanted, and some of the guys stayed back to help pull him along while Bob and I plugged away up the road, waiting at intersections at times to take a breather and let the other guys catch back up. Last year it was Sam that was just destroying all of us with his motoring up the road at such a pace that I could barely hang on. This year I felt pretty good, and Bob must have as well, as the both of us were plodding along the margins of a wide white strip of crushed rock for miles upon miles. 14 miles to be exact. (Did I mention it was 14 miles already?) It was a bit discouraging to look up and see far ahead that things weren't getting any better any time soon. Things eventually did get better, of course. That was when we crossed the Story County line back into Polk County. Then we had about 4 miles of what seemed like heavenly smooth gravel before coming back into the finish on the same roads we had left on. I don't know how our team finished, but we all came back together at the end and finished as a team. It felt pretty good. I was really taxed by the time we reached pavement and I was really, really hungry. After my return to the start I went over to hang out with the other racers for a bit and to get some much needed calories into my belly. Then I had to load up the truck and point myself back northward for the two hour trip. The 2012 Renegade Gents Race was a great event that had 29 teams take the start with 145 cyclists. All despite the forecast, and all had a pretty great time. Thanks to Bike Iowa, Kyle Sedore, Bruce Reese, and Rob Versteegh along with all the awesome volunteers for putting on this great event. I really enjoyed myself and got in 68 miles of good, hard riding. Here's to everyone involved and to everyone that rode. Hope to see you all again next year! Tomorrow I am going on a little gravel road ride called the Renegade Gent's Race down Ankeny way. This one is a bit different than your average gravel gig. The event is a "team" event. Each team consists of five individuals, (females are welcomed), and teams start together, sign on at a checkpoint together, and finish together for an overall time. Teams a staggered by "perceived ability" so that weaker/slower teams set off first and faster/stronger teams go off last. Sounds pretty intense, and it can be, but for most teams, they are out to have a challenging but fun ride. The course is approximately 65 miles with a mid-point stop for checking in. Last year I was invited to join a team on which I only knew one guy, the Captain, Steve Fuller. I got to know the rest of the guys on the ride, and it was a lot of fun. This year could be epic with forecast thunderstorms here and there and Southwest winds at 14-26 mph. Bring it on! We'll see what happens. Gas prices are on the rise, and in many places it has topped out over 4 bucks per gallon. Bicycles are on the brains of many folks. Check out this awesome piece done on the subject by a New York T.V. station which features my friend, Trans Iowa Veteran, Ari who is a mechanic there in Syracuse. I love it when Ari says, "It doesn't even matter to me." when asked what he thinks about high gas prices. Priceless! You can check out Ari and the activities of the Slender Fungus Cycling group here. Okay, that's it for today. Have a great Easter weekend. I'll have a Renegade Gents Race report up later in the weekend, most likely. You know those days when you get to ride and everything just comes together perfectly? It is the reason we all keep riding, or at least one of them, I think. Well, I can honestly say that yesterday was one of those days. It was soooo good I almost cried. Well, you can call it "climate change", or whatever, but this spring is just too weird. Everything is blooming at once. And the blue bells are bonkers this year. I can't remember seeing so many or so beautiful a display as this year's crop. I literally was surrounded at times by blue bells as far into the woods as I could see. And that with a serpentine stretch of single track right through it all. The Rockstar made me a "trail star". The scooter I was on was the Titus Cycles Rockstar. Since ditching the offensive wheels it came with, I have really enjoyed this bike. I knew it was decent, but with the WTB/American Classic wheel set it really has come to life. I know some folks are not too fond of the WTB Bronson tires, but either I have some magical set, or it is the TCS version, or something, but these seem to be behaving quite well. 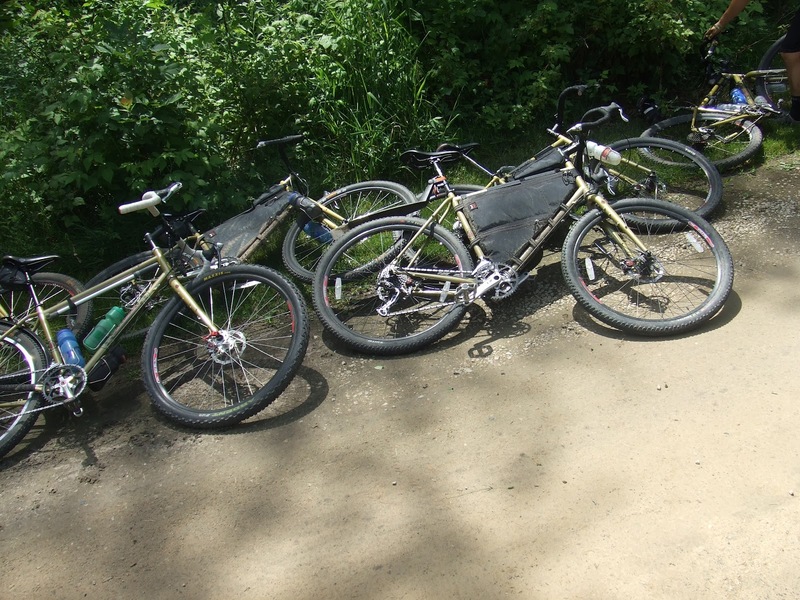 The other Bronsons I have tried were on the Breezer, and that set was sketchy, especially the rear tire. They were also folding bead tires with tubes inside. Maybe that's the deal. Whatever it is, the Rockstar is just a hoot to throw into turns at higher and higher speeds. I know for a fact that I was going around corners at The Camp faster than I had ever gone on any other bike before. Now, I am not in tip-top shape, or at least I don't feel like I am, so I am attributing this to the bike. Of course, having almost ideal dirt conditions doesn't hurt, but I've seen that before out there. Probably the highlight of the ride was when I was slicing and dicing through some twisties as a herd of deer bounded away from me through the blue bells. Amazing! That's one ride I won't soon forget. However; it couldn't last forever, and at some point I had to say "enough is enough", and point the truck homeward. I took a meandering route home, basking in the afterglow of "one of those rides", and in no particular hurry towards whatever was next, which happened to be lunch. After lunch, I got the itch to go out on one of my rarer two-a-days, so I grabbed the Fargo version II. I have some new Michelin tires I am checking out on this scoot, so I set off to see how the Green Belt was faring after the wet, mucky season was over and now that we have transitioned into a dry spring. The city actually has mown the path and taken care of the sketchy water crossing I had to traverse over the winter months. Nice. So there were no sticks and branches to worry about, as I was fearing when I started out. I obviously was not the only one recognizing the near perfect weather, as I encountered several folks out walking around in the woods, which was nice to see, actually. I had to keep this ride fairly short, since the kids were due to be picked up from school soon, and I needed to get back and clean up a bit. So, I cut the Green Belt short by heading around the lake and hitting a paved bike path which took me almost directly back home. On the way, I hit something, or more correctly, something hit me. Right in the left lens on the Oakley glasses I was wearing. Now, I saw it coming at the last minute, and it looked like either the world's largest bumble bee, or a humming bird. Whatever it was, it thankfully took a glancing blow, or I may have had whiplash from that UFO! I ended up capping off the day by having an ice cream cone with my kids. Yeah.......that was a perfect day! Is The Joke The Weather?